The thing about goats is that they really like to climb stuff. Goats have been known to climb up on top of livestock, just for a slightly better view. In 1981, Fairview Wine and Cheese owner Charles Back, who had a herd of some 750 Saanen goats, had a genius idea. Why not build something the goats can climb on? In this way, the goat tower was born. Taxidermy of a famous hippo who spent three years walking over a thousand miles across South Africa. 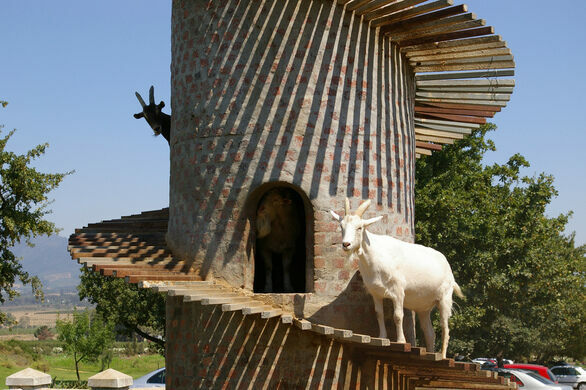 Built out of brick and mortar with a steep metal roof and a spiraling wooden staircase, the goat tower even has windows, and the goats enjoy both climbing and resting inside the two-story tower. 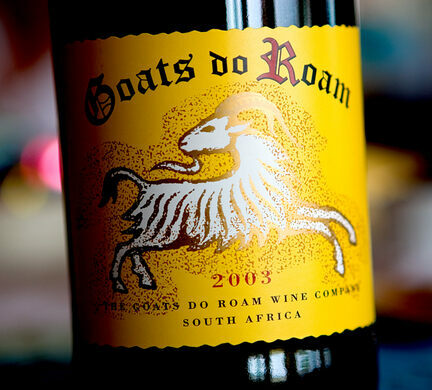 In honor of its goats, and the tower which has become a famous symbol of the winery, Fairview produces a wine called “Goats do Roam,” a play on the French wine growing region Côtes du Rhône. Though this is the first known purpose-built goat tower, others followed in Fairview’s footsteps and three other goat towers are known to exist. The other goat towers include the six-story, 31-foot-tall Tower of Baaa, constructed by farmer David Johnson, to serve his herd of 34 Saanen milk goats in Findlay, Illinois. 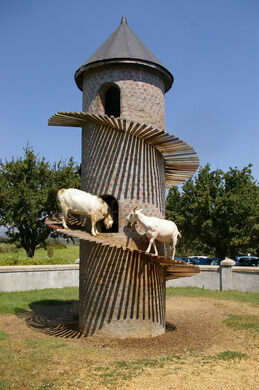 (As Johnson says, “Goats are the most curious animals in the world so they use the tower a lot. They come and go, passing each other on the ramp as needed.”) Johnson plans to also utilize the tower as an amateur observatory, which would make this certainly the only goat tower/observatory in the world. There is yet another goat tower on the Ekeby Farm in Moss, Norway, built by Finn-Erik Blakstad, based on and with permission from Fairview owner Charles Back. 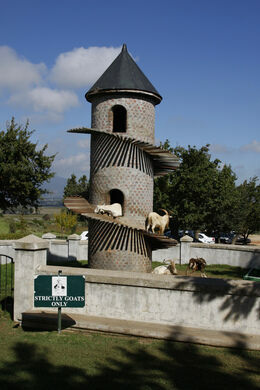 His goat tower serves as an advertisement for the restaurant he runs which utilizes the goats’ milk and cheese. And last but not least, there is the goat tower in the back of Silky O’Sullivans, a bar in Memphis Tennessee, where patrons sneak beers to the goats who happily chug them down and then go climb the tower. Though the goats climb this tower while sauced, the goats can apparently hold their beer, as there has yet to be a single accident involving a falling goat. The South African dialect's complex history is immortalized in stone, in one of the world's only monuments dedicated to a language.